Yesterday was a very busy day. I spend many hours working (on and off) on plot card outlines for the three books of my fantasy trilogy (this is a re-plot). I also outlined two other novels that have rattled around in my head for a while. At this point I’m not sure what my next step will be. Part of me wants to put away the fantasy story because I’m too married to it. The other part of me says it’s crazy to stop in the middle, after doing so much work. If I put it aside I can come back to it later with fresh eyes. I will have to think about it. For now I’m going to work on plot card outlines for at least the first book of my middle grade fantasy story. Once I have all these stories laid out in front of me, maybe I’ll stop being indecisive. Actually it’s inaccurate to say I can’t make up my mind. It’s more of a problem with figuring out what I can and can’t do physically. I have one more week of physical therapy before going back to the doctor. Unfortunately it’s not really helping. Not being able to stay sitting in my desk chair or any position for very long is causing no end of writing trouble! Some of these projects I can work on with a legal pad and a pen, which I can use anywhere. My fantasy WIP is not one that I can do that with. Using a laptop helps but not as much as I had hoped. I should probably get over hating the sound of my voice and start dictating. Reading/research related update: I’m on book three of Dragonlance Legends. It’s all about the twins and I do not like this trilogy as much as the preceding one. I don’t hate it but I’m not really invested. Maybe I’ll like War of Souls more. Reading for research is completely different from reading for pleasure so I know I’m being super critical. I’m finding more in this book to avoid than to use. This is still a good thing. I’m a big believer in the process of elimination being valuable. Another book I’m reading is Screenwriting Tricks For Authors. So far it’s interesting. I’m always willing to try something new and now that I can’t write as often, it’s a good time to learn other techniques. I’m not far enough into it to know if I will take much from it but I’m hopeful. As for my writing class, I’m determined to finish lesson 9 by the end of this week. Based on what my doctor said about next steps if physical therapy didn’t work, well, I’m going to be behind for a long time so I need to do as much as I can now. It won’t be as much as I’d like but some is better than none. Book reviews update: After I finish the Dragonlance books I think I’ll finally dive into Snow Crash. I’ve avoided the book for years, in fact my reluctance hasn’t lessened but I don’t want to put it off forever. Next month I’ll write the review. Now I have a question for all of you. Does anyone find it difficult to find my writing on this blog? Someone recently asked if there was any of my actual writing on my site. I directed him to the links in my menu bar and category list. I don’t feel the flash fiction is hard to find but I could be wrong. If anyone else thinks there is a navigation problem, please let me know. Thank you in advance. There is one thing I despise above all others: crying. Yet I found myself watching “surprise” videos on YouTube this morning, bawling like a baby each time the surprised person/people cried. I do this on a semi-regular basis. It’s one of my weird guilty pleasures. While emptying my full trashcan of Kleenex I started thinking about other guilty pleasures, and since I need to write, I made a list. I don’t actually feel guilty about most of these, but some I think are strange and some I don’t do around anyone else. Obviously the surprise videos. It can be anything from announcements to proposals, to military homecomings. If someone is going to cry happy tears, I’m there. Reality competition shows. Not all of them, but I will watch any singing contest (minus America’s Got Talent) and I love So You Think You Can Dance. I do not watch Dancing With The Stars. I do like Project Runway (because I can’t do that stuff), some seasons of Survivor and Faceoff is a new love. I’ll confess to watching America’s Next Top Model occasionally but the super doses of drama always drive me away at some point. I was really into Hell’s Kitchen but not so much anymore, but Masterchef is required watching. Top Chef can go either way for me. I do not watch the Bachelor or Bachelorette. The Biggest Loser makes me cry so it’s on the list. I do not watch lifestyle reality shows or whatever you would call the Kardashian nonsense. I have been known to temporarily get addicted to American Pickers and whatever the gold rush thing in Alaska is called in August when we visit my husband’s parents in New Jersey every year, since his dad watching that stuff. I have a new appreciation for Canadian sci-fi shows. Luckily I have Netflix to feed this emerging addiction. If you haven’t seen Continuum you’re missing out. Easy Cheese. I know, but I can’t help myself. Also Oscar Meyer Ham & Cheese loaf lunch meat. 80’s music. Not all of it, and not very often but I love to sing along (when no one is around) and I already know all the words to every song from that decade anyway, so I might as well enjoy it. I like weird cute socks. Candy. Specifically Pixy Stix, Smarties, Lemon Drops, Lemonheads and cherry Twizzlers. Old X-men, Thundercats, Danny Phantom and Sailor Moon cartoons. The Fifth Element. I watch this a couple of times a year. Starship Troopers. I have no explanation for this. Also Dirty Dancing, even though it’s not an action movie. Catchy songs that will remain unnamed. I DO have a reputation to maintain! Lucky for me I have teenage daughters who I occasionally give control of the radio to. It’s not really my fault if I accidentally learn the words to the stuff they listen to over and over. Chips. I’m seriously trying to get over this one but I don’t want to! I gave up smoking, giving up chips is ten times harder! Plus chicken strips. This will be the last unhealthy food I give up. Snyder of Hanover’s Salted Caramel pretzel pieces, and English Breakfast hot tea. Mints, most flavors. This probably stems from the quitting smoking thing. Cracked.com. No one can read/watch just one. Same with Buzzfeed.com. Online games, specifically World of Warcraft. Buying office supplies. I can never have too many pens, pencils, notebooks, etc. Especially pens! I will admit to marathoning Buffy, Charmed, Smallville (surprised me too), Supernatural, Battlestar Galactica, All the Stargate shows, Doctor Who, Torchwood, The Arrow, Chuck, Continuum, Highlander, Alias, Firefly, Grimm, John Doe (so before it’s time! ), All Star Treks, and occasionally Hercules and Xena. If you consider that I’m a fantasy writer, this is all research! I can neither confirm nor deny owning most of these. My last and best guilty pleasure is rereading certain Fantasy series every year. In no way do I feel guilty about this though. Certain books are meant to be cherished and enjoyed forever. Nothing heavy allowed on my reread list. I don’t do Lord of the Rings, but I do read Harry Potter every year. No literary fiction but Terry Brooks, David Eddings, Anne McCaffrey and Brandon Sanderson make the cut, plus many more. I read fast so the list is necessarily long. What about you? Any guilty pleasure you want to share? I’m sure I’ve left some off the list. Okay, I admit it. I cheated on a book. I didn’t mean for it to happen, I resisted for as long as I could. I was reading the novel I meant to review this month, The Blade Itself: The First Law: Book One by Joe Abercrombie, but another kept catching my eye. Joe’s book is good, but I was having a bit of trouble getting through it. It’s on the grim side. So was the book from last month, and the one before. That was the problem. Too much of the same thing wears thin, eventually. It got to the point where I was plodding through instead of enjoying myself. 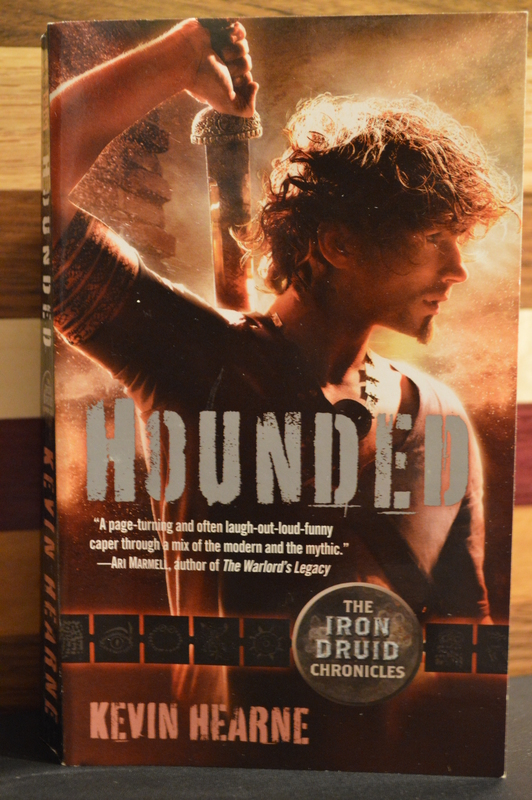 Not helping matters, book one of The Iron Druid Chronicles — Hounded by Kevin Hearne was sitting on the shelf, metaphorically showing me leg. I don’t even know what made me do it, hell I don’t normally like first person narrative! There was just something about the book I couldn’t resist. So I gave in to temptation and read it. At first I felt guilty putting Joe Abercrombie to the side, but not for long. The first line of Kevin Hearne’s book took away all remorse. Before long I didn’t consider it an indiscretion, it was more of a needed separation. Plus I loved Hounded so much, I am unable to regret reading it. The review will be posted soon. Now I can go back to Joe with a more open mind and lighter heart. Sure I’ll be reading grim stuff again but it won’t feel like I’m reading the same old, same old anymore. I can give him my undivided attention and the appreciation he needs. Oh look, Brandon Sanderson’s The Alloy of Law is sitting on the shelf winking at me. Sidenote: I will be buying the rest of the novels in The Iron Druid Chronicles, so there might be more posts like this forthcoming. One small, yet huge addition to my Writing Updates post from yesterday. The main character in my fantasy series, named Darian, was abruptly kicked to the curb today. At least, that’s how it felt. This has really been happening for months, but it took some time for me to face the facts. His younger brother, Caeleth has taken his place as my protagonist. There are six main characters and Darian still has a place in that. However the story really centers around the brother. They’ve both been trying to tell me that for a long time and, as previously mentioned, I’ve been taking steps toward listening for a few months. I have many reasons but one that stuck with me was there are so many stories with royal brothers told from the perspective of the crown prince. Also a lot of them pit the brothers against each other. I like the idea of the story coming from the younger sibling and he doesn’t want to kill his brother and take the throne. I’ll tell you all more about Caeleth in the months to come. I put the poor guy through the ringer. He’s the best character I’ve ever written (my bias is showing) and I’m embarrassingly proud of him. This month’s book is The Dragon’s Path by Daniel Abraham. I’ll start with the good. The prologue was amazing. It pulled me in quickly and didn’t let me go. The last line got me super excited about the book. The world in this novel is fascinating. It is set after the fall of the dragons, which I certainly want to know more about! There are many races of humans and a lot of political intrigue. The settings are vivid and clear. The book is bursting with potential. Unfortunately I don’t feel like that potential was realized. Five hundred fifty-five pages is too long for a prologue, which is what the entire book came across as. It seemed more to hint at the plot than reveal it. I understand that this is merely book one of four, but I wanted more. Instead of making me desperately want to read book two, it made me disappointed that I wasn’t as drawn in as I should have been. There were several things that caused this. First and foremost, I didn’t like most of the characters and I should have. I couldn’t really relate. I apologize for the vagueness that will follow but I want this review to be spoiler free. Cithrin – Orphan, ward of the bank. I had trouble seeing any depth in this character, although I hope that changes in the next book. It sounds horrible to say but I find that I want something terrible to happen to her so that she’s forced to evolve. Geder – I felt sorry for this guy, until I didn’t. This is the guy that gets used by everyone, all the time, even when he thinks he’s in control. There was no real growth. However, there were hints of it for the rest of the books. Dawson – The only things I can really tell you about him is that I like one of his sons and his wife, and he’s kind of an elitist jerk, but means well. The Apostate – Seems good, at least wants to be good. He’s pretty interesting. This is about all I have to say about the characters because I don’t know them better, and I wish I did. I suspect they will each become utterly fascinating, as I’ve heard the story picks up in the next two books but I want to be intrigued now. I want to go back to some back-story here. There are a lot of different races in this world, although they all started from firstbloods, aka human. They were changed by the long dead dragons. I would describe them for you here, but I can’t. There was little description and nothing really stood out to me. I feel like this is a missed opportunity. I would love to know more about each race. Why were they changed? How? When? Was each race considered a success? Another thing I want to know is what happened to the dragons. This is also something only hinted at, which is good in this case. I do hope to learn more though. Earlier I mentioned political intrigue. The Dragon’s Path has plenty of that. The only problem is I didn’t care who came out on top. From all the scenes dealing with that, the only thing that stood out to me was a creepy banker guy. Now that is one character that is well written. He’s meant to be mysterious and scary and he is! Overall I thought the book dragged on a bit. It wasn’t uninteresting, but it wasn’t compelling. Does this review seem a little all over the place? That’s how the book was for me, so it seems appropriate. I guess this boils down to a question. Will I buy the next book and see if the story picks up? Probably. I am curious to see what happens. Book two will help me decide if I’m curious enough to see how it ends. I would give it 3 out of 5 stars. In all fairness we need a little disclosure here. I am more into books with a lot of action, epic battles, magic, and emotional intensity. Since this is a series, it could end up with all of those things. I’ll let you know. For the full list of books I intend to read and review for this series, and my reasons for wanting to, click here. Don’t forget to like my new Facebook page. Thanks! Sidenote: I’m sorry for this review being so late. I hope to have the next one ready for the middle of next month. However my priority needs to be on my own writing so I’ll also apologize in advance if the next one is late too! One more sidenote: I bought The Dragon’s Path used from Amazon early last year but didn’t get to read it until this month. To my surprise and disgust, when I started reading it, in the first 25 pages, every time the word blood appeared (about 10 times), the previous owner literally covered the word with what looked like blood. GROSS! I recently got three new bookshelves. As I’m sure most of you will understand, this only partially fixed the problem. I will still have to double stack but I won’t have to have two rows and two columns on every shelf (only half of them). Knowing myself well, I can tell you this post will not be accurate after six months or so. There are worse vices.